It was a late night for Harry on his first night of the Everglades Challenge. He sailed in the dark all the way to the first checkpoint. 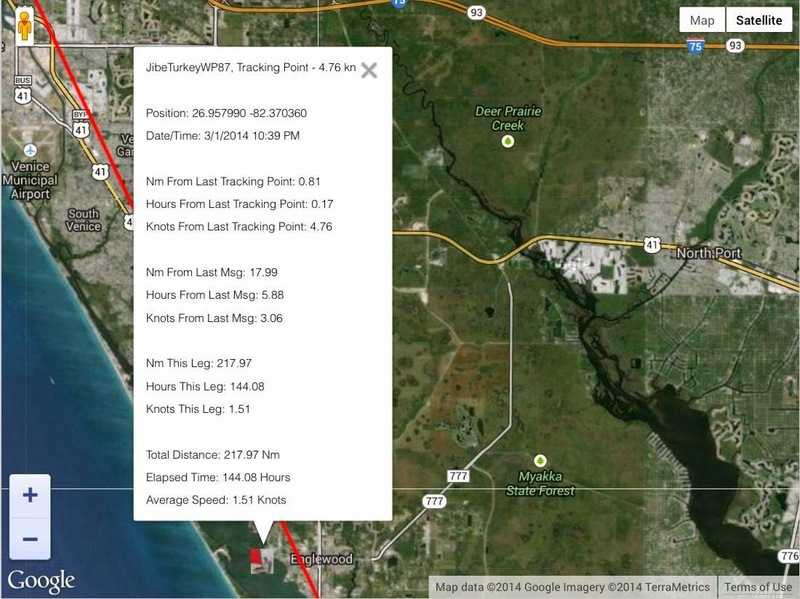 The tracker shows him going pretty darn fast, 4.76 knots. Ignore the stuff at the bottom that seems to include everything since his OK message in Jupiter last week. The third paragraph that shows Nautical Miles from last tracking point and a fraction of hours is what is relevant. I could see by the results page that there were lots of people there so it was probably not as grim as it sounds, getting to a marina in the middle of the night by yourself. Harry appears to have waited around for Bryan (AhMaChamee) who got there less than an hour later. This morning at 8:21 EST 2 March I got another OK message. 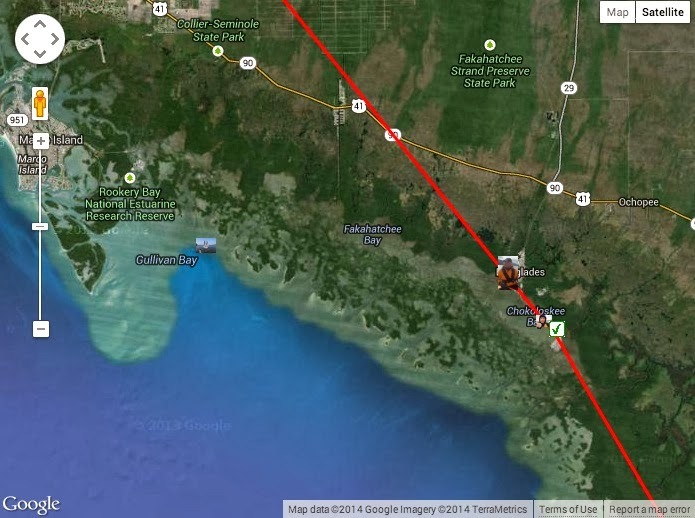 He appeared to head out from the camping spot towards Charlotte Harbor. I found an OK message from Bryan in the same spot at the same time on the Challenge Tracker so that confirms they camped together. Bryan doesn't seem to be running his tracker all the time, just pushing OK when he starts or stops. I'm glad Harry is running the 10 minute updating tracker. That only works when the right satellites are in range though. You can see the spacing of the updates changing over the course of a day. At about 10 am Harry and N8R headed out into the Gulf at Gasparilla Pass. I got frustrated trying to get speeds off the Challenge Tracker on the WaterTribe website so I found an online web tool to convert the two points from the SPOT tracker page to a distance so I could calculate it myself. 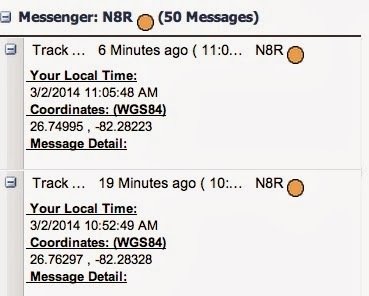 I typed in the Latitude and Longitude of the last two points on the SPOT tracker. Here's where I got the data for the calculation. Click the + next to the track point and it opens up details. That's 13 minutes. 13 minutes/60 minutes/hour = 0.217 hours. So if Harry calls me up and asks how fast he's going or how far he's gone I'll be able to figure it out. 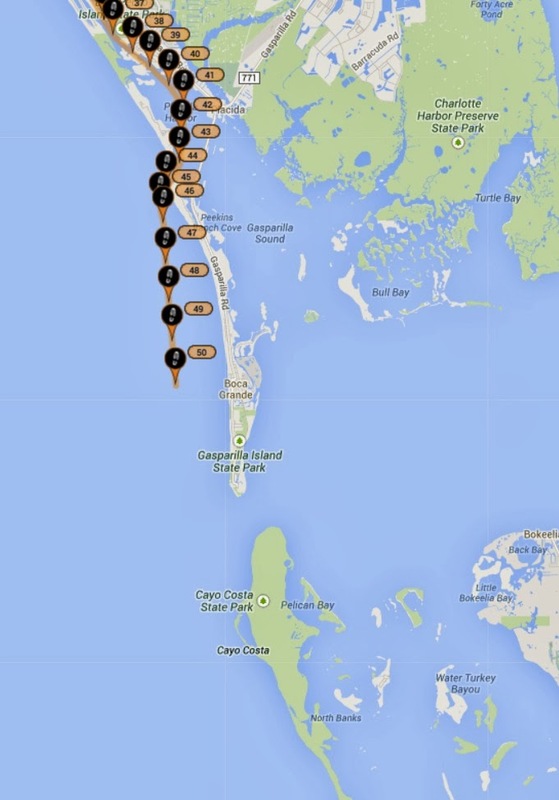 It must be pretty calm for him to be out in the Gulf and going slower than he was last night. It's a beautiful day here and I think it's about the same down there. 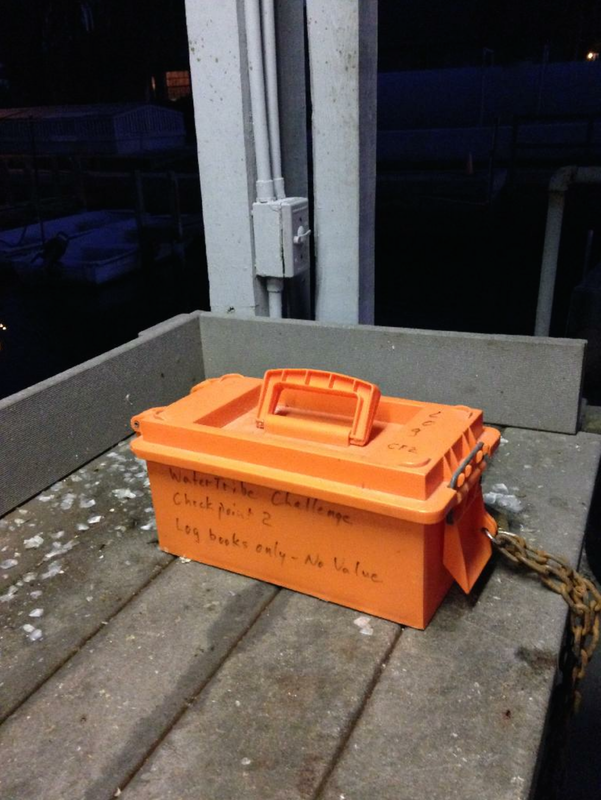 get out of your boat and go sign the log book inside the orange box. The next checkpoint is in Chokoloskee Bay. The first challenger got there last night about the time Harry got to checkpoint 1. It was Randy Smyth (SewSew) in his custom built trimaran. SOS and Poptarp in the Mosquito are almost there now. There seem to be other people getting close already. I think the bulk are back where Harry is though, taking it easy and not trying to set speed records. If the wind died down these guys in the trimarans would probably stop having fun pretty fast. I hope they camp tonight and get some rest. There's no deadline to get to the second checkpoint. The first one you had to reach by today at noon. It looks like most people are going to make it. Update: The problem with checkpoint 2 is that its hard to get there at low tide, which is pretty much all day. 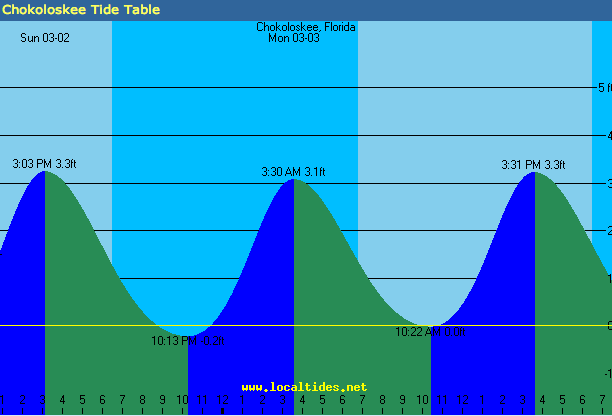 (Here's the website for tide tables) The best time to get there yesterday was in the middle of the night, like Randy Smyth did. When people got there this morning they had to walk a long way through the mud. For people who make it all the way to Marco Island tonight they can probably ride the rising tide tomorrow when high is at 3:03pm and get there without worrying about mud. I wonder if there's a strategy for the people who are really taking it easy that involves camping nearby then popping over there at 3:30 am on Monday night to check in. If you got there right at sunrise it would have an extra 2 feet of water at least. Better than down half a foot. I really don't like getting mud in my boat.